Every Friday we have a roster of resident DJ playing every Friday from 8pm until 11pm. On Saturdays we have live entertainment with regular singers to get the party going. Once a month "Funny Guys" comedy club do a Sunday evening session with the best up and coming comedians from the London comedy circuit. 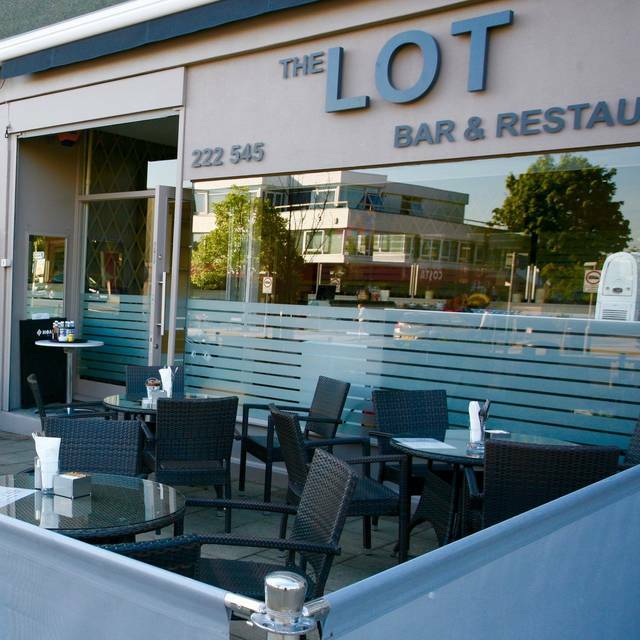 Lot Bar and Restaurant is a family run business offering freshly prepared food from 8am until 10pm daily. Whether you are looking for an informal breakfast or light lunch with friends or a 3 course celebration dinner in the evening or simply a drink in the bar after work, we have the best to offer locally. We at "the Lot" take pride the quality of our ingredients, the high standard of presentation and excellent service. A seasonally changing breakfast and lunch menu offers everything you could want from a kitchen and our evening A la carte menu includes restaurant favourites as well as daily changing specials. On Sunday afternoons we offer the best Roast available. Our wine list, available from 11am, is curated by us to include the faithful, the unusual and the interesting. The bar has regular DJ"s and live music on the weekend and a monthly Comedy club, run on a Sunday night. Lot 75 has expanded since I last visited so I took the precaution of booking a table beforehand. Happy to recommend to like minded diners seeking a casual interlude. The wine 🍷 that the table next to me were enjoying looked very tempting. A couple of pots of tea 🍵 for me this time. A lovely birthday dinner for my daughter. Service and food always outstanding and good value. The service was very slow, three people left mid dessert because their 2 hour parking was running out. Very very noisy shrieking women. Love having breakfast at the LOT. Food is amazing and the price is reasonable. Would of got 5 stars for food and service but was refused a side of baked beans because it was 12:09 and beans are considered a breakfast food, my 1 year old wasn't impressed. Sunday Roast: Meat was lovely really tender and well cooked, potatoes good too. Vegetables were really underdone, really too crunchy for us, Cauliflower cheese needed to be cheesier and saucier. Service is always outstanding. Overall OK. Would definitely ask for my veg to be cooked through in future! Excellent food as usual, staff very friendly and helpful. Excellent Roast for Sunday lunch. Food and portions were good for the price. Some party members thought cauliflower w/cheese quite poor but this was a side order. It's a noisy place but service is efficient. Seating is utilitarian rather than sumptuous. Yes, I would go again for Sunday Lunch but it is not a place in which you can linger for too long. We had a lovely meal for my husbands birthday. The slow braised lamb was absolutely beautiful. Great food and efficient friendly staff. Quick service and the staff were attentive to detail and quick with drinks. My partner had steak and described it as having amazing flavour. As always the service and food was excellent. Staff are always friendly and the menu choice is really good - the salads are always beautifully presented. Lovely food, lovely atmosphere and great service. Menu hasn't changed in a long while so would be nice to see some new items on the menu. Always a great meal in this place! This was my first visit to Lot, having been recommended. We had a pleasant lunch but at a reasonable price. Always a great experience, the staff are so welcoming and friendly and it's incredibly family friendly. The food is just delicious. Went for an early dinner with a couple of mates and it was spot on. Straightforward, not overly expensive and nice quality food and service. Really lovely food, excellent service and good value for money. I love the people working at this place, and the food has always been exceptional. Lovely dinner here at the weekend with the family , service was amazing the staff are so personable and great with children they couldn’t do enough for us ! Love this restaurant. This is our go to place when we eat out. Food never disappoint, service always amazing and extremely friendly staff. A very enjoyable lunch, the beetroot burger was delicious, only criticism was that it was extremely noisy in there. Food was lovely and the staff couldn’t have been nicer. They were very friendly and couldn’t do enough for us. We had a great meal tonight: the chef’s special cod with risotto was fab. Food as always is good, served promptly and attentive waiting staff who are great with children. Once again, delicious Sunday lunch. Beef and lamb both beautifully prepared and tender, lovely fresh vegetables and perfect yorkshires. The gravy is always a little too thin though, which is a shame. Good value for money, at least average service, a great (albeit small) venue and some well mixed drinks. Some spotty dishes/ glassware, but otherwise clean environment and friendly/ accommodating staff. Would recommend and go back for more.